The Gwalior city is now both sprawling and crowded, with a population of perhaps 2,000,000, but until recently it was relatively small, and designed to be small. The fort occupies a plateau in what is now the center of the city, but was once on its western boundary. The plateau is about 300 feet high built of basalt, rising steeply from the plain below. It is a bit less than two miles in length from north to south, maybe an average of a half mile from west to east. 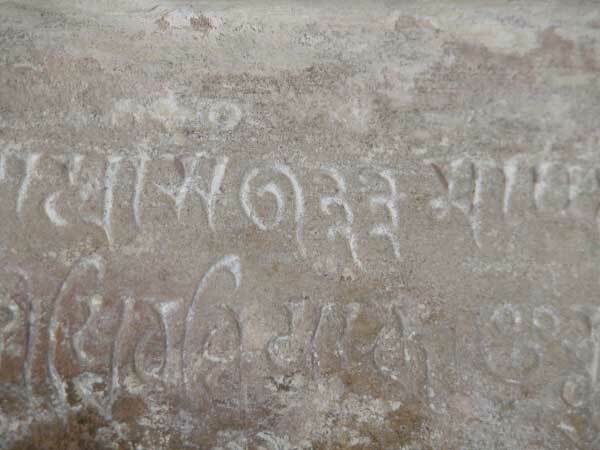 The site is of mathematical interest because of what is written on a tablet recording the establishment of a small 9th century Hindu temple on the eastern side of the plateau (marked by the on the nineteenth century map at the left). 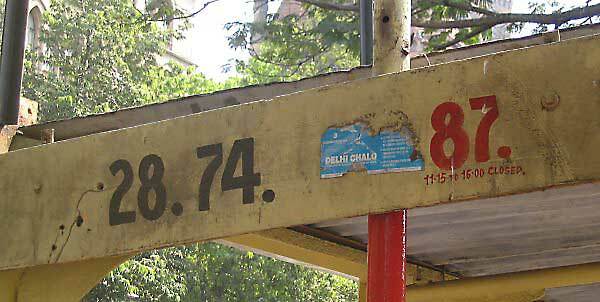 By accident, it records the oldest zero “0” in India for which one can assign a definite date. The temple is dated to 876 A. D. and is much older than the current fort, whose construction was begun in the late 15th century, although it was built quite a while after the original one constructed on the plateau. It is, like many temples in India, monolithic – that is to say, originally carved out of one single chunk of stone. It was dedicated to Vishnu, but is no longer an active site of worship. 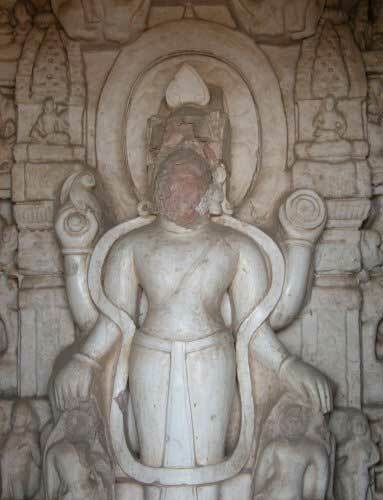 The temple is named Chatur-bhuja, that of the four-armed god. Who was reponsible for the (literal) defacement of the statue is not known to me. Just inside the inner chamber, on Vishnu’s right hand side, is the dedication tablet. The tablet records the date (in the local era, which started in 57 B. C.), the dimension of a land grant to a neighbouring temple, and the size of a daily gift of flowers to be paid for from an endowment made to this temple. 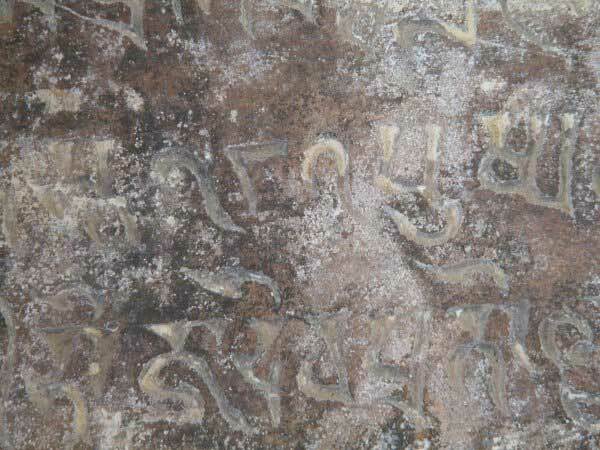 What the Gwalior tablet shows is that by 876 A. D. our current place-value system with a base of 10 had become part of popular culture in at least one region of India. We know almost nothing of how this decimal place-value notation came about, although there are many suggestive facts. One feature of Hindu culture in the middle centuries of the first millennium was that its texts were largely in verse, and preserved through oral tradition. It is hard to fit a useful numerical notation into such a scheme, and in fact what we see is a large literature, written down only much later than it originated, with numbers – often very, very large numbers – written in a kind of decimal place-value notation, but in words instead of symbols. Furthermore, the demands of the metric of the verses required that the exact words chosen to represent a given digit might vary from one point to another, so as to scan correctly. Whether this usage overlay more convenient calculation with symbols is not known to us, although it is almost inconceivable that it did not. Another problem is that the climate of India is harsh. Paper was introduced to India late, and until then the materials on which things were written were birch bark in the north and palm leaves in the south. These are both extremely fragile. There are many extant manuscripts written on these, but nearly all of relatively recent date. One of the more intriguing questions about the origin of decimal place-value notation is what connection it had to a much older tradition from a nearby region. The Babylonians began writing in about 3000 B.C., and had the good fortune to write on clay tablets, which can last for a very long time. We have extensive records from several thousand years of their development. They used an extremely sophisticated place-value system, remarkably much the one we use today, from very roughly 2000 B.C. on, but with a base of 60 instead of 10, and without “0”. All the evidence that I am aware of suggests that this was technology acquired only by an elite group through rigourous training. This somewhat ambiguous notation persisted to about 300 B.C. when Babylonian astronomical tables started to incorporate a symbol that to some extent performed as zero, that is to say as a sign to indicate a space between two “digits”. This was adopted in modified form by Greek astronomers after the conquests of Alexander, and this science in turn was transmitted (along with astrology!) to India sometime in the first few centuries of the current era. Exactly how these transmissions occurred is lost to us. Alexander Cunningham, Four reports made during the years 1862-63-64-65, Archaeological Survey of India, 1865. Section XVI of volume II contains the only substantial history of the city and principality of Gwalior that I have been able to locate. Cunningham mentions the temple and the tablet as well as its date 933, but does not mention the other numbers. 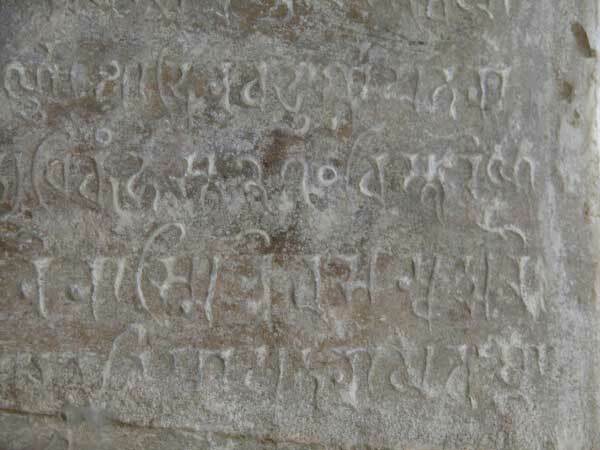 E. Hultsch, The two inscriptions of the Vaillabhattasvamin temple at Gwalior, Epigraphia Indica I, pages 154–161. There are two inscriptions in the temple at Gwalior, one just above the entrance in a small domed porch, and the other on the left inside wall. The first is, as Hultsch says, written in a more attractive style (and, he also says, a more stylish Sanskrit), but has no mathematical interest, contrary to what is sometimes said. 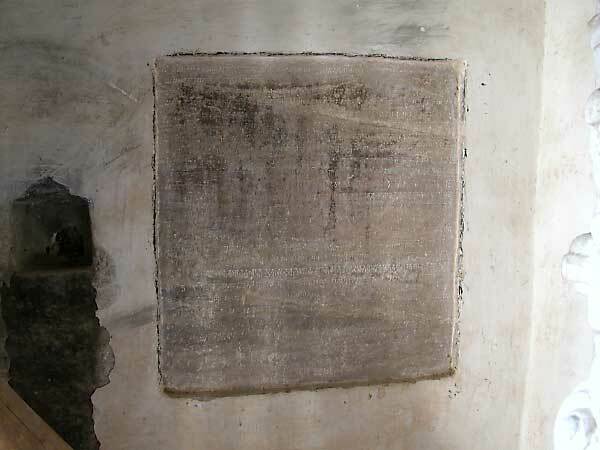 Hultsch’s article contains a transcription of the tablet into modern Sanskrit script, an English translation, and a reproduction of a rubbing of the tablet. Aside from the numerals, the tablet does not seem to be of much historical interest. George Ifrah, The universal history of numbers, Penguin, 2000. This book is useful, perhaps even indispensable, for someone interested in the history of numbers. It is a huge compendium of material, some fascinating and much – alas – of very little interest. One problem is that the author fails to warn you when he is relying on secondary material and when on first hand. 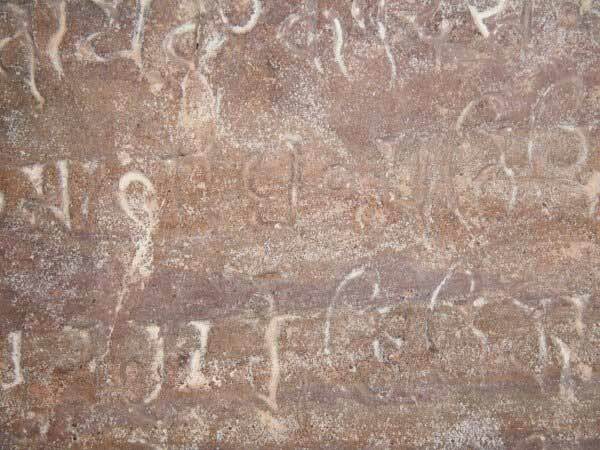 This problem actually arises in his account of the temple of Gwalior – he has apparently misread Hultsch’s transliteration and thought that the numbering of the Sanskrit verses found there was part of the inscription. One very valuable feature of Ifrah’s books is the extensive bibliography. Robert Kaplan, The nothing that is, Oxford University Press, 1999. This book mentions Gwalior, but it is an uninteresting account, and seems to be passing on only third-hand information (as I have said, a frequent phenomnon in popular accounts of the history of science). I doubt that he has bothered to read Hultsch’s article. but instead seems to rely principally on Ifrah. Even taking this into account, the sketches of the numerals at Gwalior have strangely little resemblance to the originals.